The A&M-Rice game was played on a gray, mid-November day in Houston. Led by sophomore QB Tommy Kramer in his career break-out game, the Owls stunned the Aggies by rolling to a 17-0 halftime lead. The natives were restless. Then out came the Rice band. 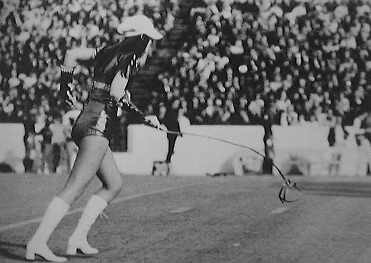 They had in mind what their leaders thought a gentle parody of A&M and its traditions--much the same as a spoof which was cheered on by University of Texas fans earlier in the year at Memorial Stadium. 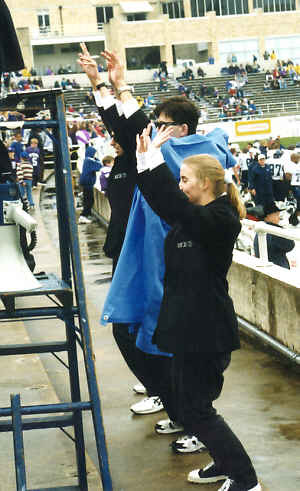 The Rice drum major wore rubber boots, in parody of A&M's cadet corps seniors. 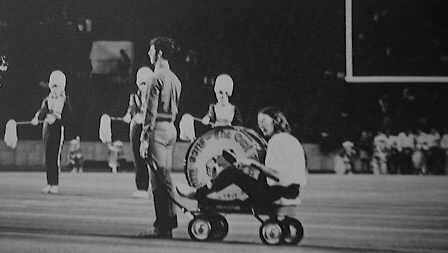 The band formed a fireplug, in reference to A&M's collie mascot, Reveille, while a twirler paraded with an empty leash and the band played, "Where, oh Where has my Little Dog Gone?" The band wore an unmilitary motley assortment of headgear, at at one time actually (gasp!) goose-stepped down the field. The band formed a ragged A&M block-T, to the tune, not of the War Hymn, but to the March of the Wooden Soldiers. End of show. Silly Joe-College humor. The kind of stuff Ivy League bands did every week. But fighting words, apparently, to a raft of A&M fans-- cadet corps and middle-aged ladies in maroon pantsuits as well. The Aggie Band pushed through the Rice group back into the stands. Ice, epithets and not a few fists flew. The mood remained ugly throughout the second half. The fired-up Aggies came storming back With a minute or so left in the game, they scored, to take a 20-17 lead. ("We've got 'em now. That'll show those g-d COMMUNISTS!!"). But Rice deep man Carl Swierc took the ensuing kickoff, bounced through a hole and raced 100 yards for a Rice touchdown! Victory literally was snatched from the jaws of defeat. And then things turned really nasty, as the game ended. A crowd of perhaps a thousand Aggies charged the Rice band. The band members collectively ducked for the tunnel beneath the south end zone. There they held, Aggies furiously pounding at the doors. And they stayed. And stayed. Hours and hours. The whole story of the day, with its anticlimactical denouement, is told first-hand by then-Rice Thresher editor and Mob member Steve Jackson. It's an interesting read. But perhaps the main story of the event lay in its retelling over the years. In A&M lore, the actions of the MOB became more and more heinous as the years went on: It was told that they had made fun specifically of a recently- deceased mascot. That they had descrated the memory of Aggie war dead. That an American flag was burnt during the performance. The truth, of course, is much more tame. But the unpleasant developments were reflective of the fact that the behavior of the irreverent Owlies had been a major irritant to the Aggies for years--one which apparently continues to this day.